The What: Crestron is now shipping two new products for in-wall and centralized 0–10V control for LED lighting. The What Else: The Cameo Wireless In-Wall LED Dimmer (CLW-DIMFLVEX-P) placeholder is designed for dimming 0–10V voltage light and is easily installed in any standard 1-gang wall box. Versatile and affordable, the CLW-DIMFLVEX-P features field-replaceable engravable buttons, and can be configured with various button layouts and designer colors. 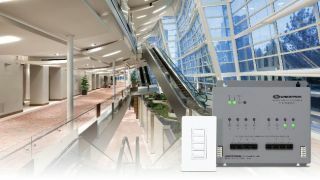 Easy to install, these dimmers are well suited for retrofit applications. White LED indicators make it easy to find in a dark room and provide visual reference of current dimming level. The dimmer is available in 120, 230, and 277V models. The In-Panel LED Dimmer Module (CLX-2DIMFLV8) placeholder enables centralized LED dimming and control of any load type (forward or reverse universal phase and 0–10V) with a single cabinet. The Bottom Line: The new Cameo Wireless In-Wall LED Dimmer (CLW-DIMFLVEX-P) placeholder and In-Panel LED Dimmer Module (CLX-2DIMFLV8) placeholder are engineered to make design, specification, and installation of centralized LED lighting control easier and more flexible than ever.